With pressure sensitive lamination you can create either flexible display graphics, or rigid display graphics. Flexible display graphics are perfect for retail stores, grocery stores, trade shows, hotels, etc. They are very popular as pop-ups and directional signs for hotel events. Rigid display graphics are prefect for when you want to laminate and mount in one easy step, creating a firm and durable graphic that is sure to last. In this review we will discuss one of our most popular small cold laminating machines: The Xyron XM 1255 12” Cold Laminator. The Xyron XM1255 is a cold laminator that offers three solutions in one machine: it is capable of laminating with standard gloss double-sided film, a laminate with repositionable adhesive back, and a laminate with permanent adhesive back. Cold laminating applies a film or adhesive to the application using high pressure rollers only, with no heat. This process requires no electricity, eliminating heat, fumes and smells, messes, and warm-up time. 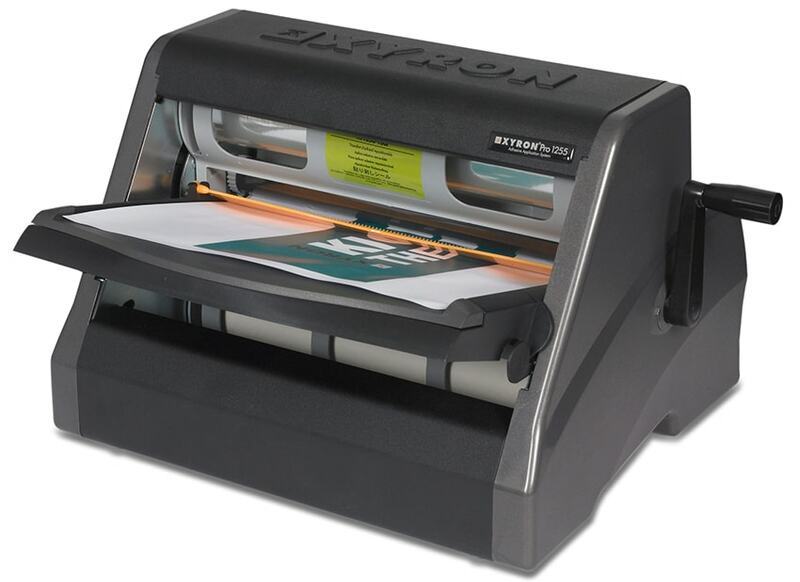 This Xyron laminator is extremely user friendly; perfect for home, schools, offices, and more. The Xyron XM1255 has a maximum laminating width of 12” and a maximum roll length of 100’ of 2.7 mil film. The rollers are hand crank operated and you can mount up to 1/8” thick foam boards. The XM1255 takes proprietary roll cartridges with a 2” core. It measures about 10.5" x 13" x 15" and only weighs about 15 lbs., making it the perfect mobile laminator for small offices and schools with limited space. While the Xyron XM1255 pressure sensitive laminator is a great machine for personal, small office, and educational use, it does limit the user in a couple of ways. 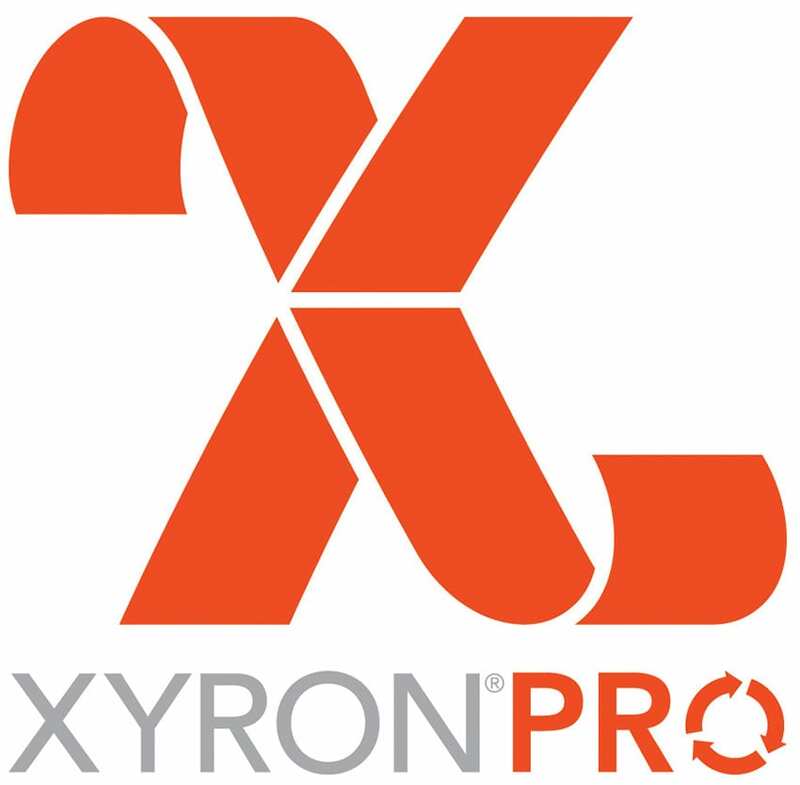 First and foremost, the Xyron XM1255 will only accept Xyron’s proprietary laminating film cartridges, limiting possible sources for the lamination supplies; standard cold laminating film cannot be used with this Xyron machine. The up-side to this limitation is that Xyron is such a well known brand, that many sources offer the film cartridges, so they should now be too difficult to find - You can even find XM1255 refills right here. In addition, the maximum laminating width is 12”, limiting application sizes to this width, making it ideal for letter size document lamination. The maximum laminating film thickness that the Xyron XM1255 will accept is 2.7 mil, making it ideal for school lamination where the standard film is typically no thicker than 1.5 mil or 1.8 mil. Pressure Sensitive Laminators (also known as Cold Laminators) apply laminate or adhesive using high pressure rollers, often times without the use of electricity, which makes them environmentally friendly and energy efficient. There is no more waiting for your laminator warm up, these machines are ready to go right away and require no cool down time before shut-down. Pressure Sensitive Laminate is sticky to the touch, and features a removable release liner that covers and protects the adhesive. What sets a Cold Laminator apart? Cold Laminators are perfect for laminating and mounting outdoor signage and displays because most standard cold films come with UV inhibitors to protect against sun damage. It's difficult to find hot lamination that has the UV protection necessary to keep your outdoor displays vibrant, but UV Protective Cold Lamination is readily available. Pressure Sensitive laminators are most commonly used for posters, book covers, outdoor signs, photographs, display charts, restaurant advertising and menus, super market & grocery store signage, retail signs and advertisements, trade show graphics, and more. Cold Lamination has many benefits over heated laminate: it allows for high production rates, is protective and durable against outdoor extremes, enhances the print quality and appearance and often times requires no electricity to run. The most common complaint received about cold laminating is that the lamination film is only available in small varieties.